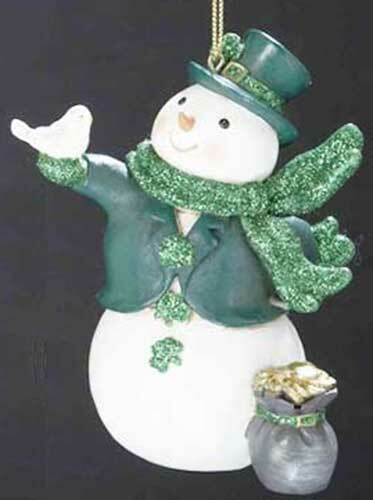 Irish Christmas ornament is a snowman that features shamrocks along with a pot 'o gold and a bird in his hand. This Irish Christmas ornament is from Kurt S. Adler. This Irish Christmas ornament features a dimensional snowman who is enhanced with a shamrock and pot of gold along with a green glitter scarf. The Irish snowman ornament is made of resin and measures 3 1/4" wide x 4" tall; he is ready to hang with the included gold cord.